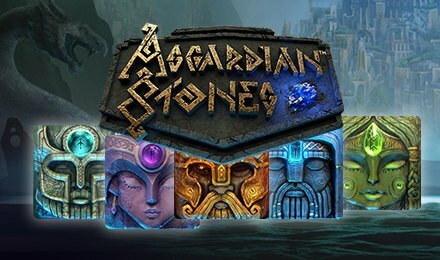 Asgardian Stones slots is the newest creation of NetEnt. Playable on either a tablet, a mobile phone or a laptop, this slot game has been added at Wicked Jackpots for you to enjoy. This online slot takes you back in the years where Norse mythology was a reality. Let yourself be immersed into the Greek Mount Olympus through the backdrop of the game. The various symbols which fall on the reels of this game are Wild, A, K Q and four Norse gods. This game uses the special avalanche feature when it is activated. Thus, you have higher chances of playing. The avalanche feature is used while this game is on; all the symbols fall down the reels, instead of rolling. To simplify your gameplay, the auto-play option has been integrated on this game. You can select few rounds of game to be played automatically, without having to click on ‘Spin’ every time. Amount of Paylines Selection: The 20 paylines are fixed and cannot be changed throughout the game. Coin Values: The coin values you can choose from vary from £0.20 and £200.00. On this creation of NetEnt, you will discover many special features which will take you on could nine. Through the base game and the free spins round, all the symbols apart from the wild, can be seen as colossal on the reels. These symbols can be seen as 2x2 or 3x3. After an avalanche, the Colossal Crush Feature can be activated. The colossal symbol will fall to the bottom of the reels, and it will crush any symbols which can be seen on the reels. For every symbol crushed, you will receive winnings of 1x your stake. During this feature, you can win a maximum of 4x your total bet. There’s a 3x3 symbol which acts like the Bonus Wheel on the reels, and it can land only on the last three reels. After all winning combos have been paid, the bonus wheel will start to spin. Depending on the outcome of the wheel, you can either win free spins or coin prizes.